“Pride-respect-honor” has been Barnstable High School’s motto since 1893; students, athletes, teachers, and members of the community define this slogan. Some students may disregard these values, but many take them to heart and carry them beyond BHS. 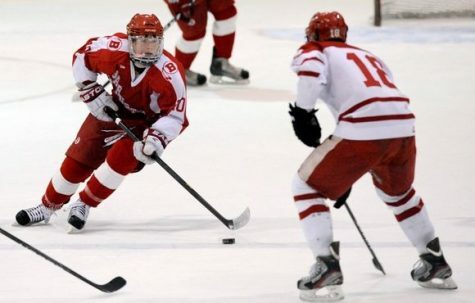 Barnstable graduate Max Willman, class of 2013, was drafted by the Buffalo Sabres in the fifth round of the 2014 NHL Draft, bringing these values with him to the next level. Willman was born and raised on Cape Cod, which laid the foundation for his passion for hockey and flourishing athletic career. Willman went from BHS, to Williston Academy, to Brown University and is now playing for the Boston University hockey team, where he is in graduate school. His athletics and relentless dedication have opened doors to an extraordinary educational career. He credits his upbringing for helping him get to where he is now. “Barnstable High School is where I learned I wanted to continue hockey after high school and pursue playing at the next level,” said Willman Willman takes tremendous pride in being from Barnstable where he was able to play in front of his friends and family. “What I learned most from my coaches and teammates at Barnstable was having pride in the jersey that you were putting on,” stated Willman. Every time an athlete puts on a jersey and steps on the ice, court, or field they are representing their school and their town. “So many people have came through Barnstable and put on that same jersey,” said Willman, “to go out each night in front of alumni and people from your town meant a lot to me.” He carries this same mindset into his career now– “thinking about the history of the players at Brown and Boston University, and all the people that came before me” is humbling for him. Growing up, Willman learned from watching those around him and incorporating their morals and values into his own life. “My mom and dad taught me the importance of hard work and discipline,” Willman stated. “I also learned from watching my older sister work hard every day, which shaped me into who I am today.” Willman’s athletic skill and character made him stand out amongst other high school athletes which drew prep school recruiters at a young age. Willman was looking into a couple other schools but decided to attend Williston Northampton School in Easthampton, Massachusetts after he graduated BHS. “[Williston] taught me to live on my own and manage my time. This was a skill that helped me transition into college,” said Willman. However, attending Brown University was still a major change for Willman. “Ivy league academics were rigorous,” said Willman, “and handling the full schedule of a division one athlete on top of school was challenging.” In four years at Brown, Willman recorded 45 points in 99 games and proved himself to be a hard-working, two-way forward. However, last year, in his fourth year, Max was limited to only nine games due to a devastating ACL injury. After a strenuous recovery period, Willman was able to get back to where he was before the injury and play for Boston University, where he is currently earning his master’s degree in financial management. Willman also played in The Beanpot earlier this month, which is an annual tournament between four of Boston’s men’s hockey programs: Boston College, Boston University, Harvard University and Northeastern. It’s the same four teams, every year, playing in two semifinal games with the winners advancing to compete for the title. Willman grew up watching these games on TV, and is grateful for the opportunity to be a part of such an influential event. Willman plans to continue playing hockey, keep improving and strengthening his skills and eventually hopes to play in the NHL one day. And he certainly won’t forget his Barnstable roots and the legacy he leaves behind him. “I would say to a high school athlete,‘don’t take it for granted. Cherish these days playing with the people you grew up with because it goes by so fast.’ I still think back to how fun it was playing for my hometown in front of a crowd of familiar faces,” said Willman. While still pursuing his NHL dream Max has built an academic resume to be successful.